Bob Bailey is “of counsel” to the firm. He is Board Certified in Civil Trial Law by the Texas Board of Legal Specialization and is one of the founding members of the Houston Bar Association’s Construction Law Section. Bob has extensive experience in trial and appeal of commercial litigation matters. 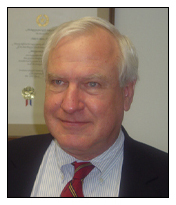 His experience includes numerous civil jury trials and appellate matters involving construction contract disputes, shareholder and partnership disputes, claims on notes, claims relating to the sale of goods, real estate and personal property disputes, employment contract disputes, officer and director liability claims, bad faith claims against insurers, and enforcement of pre-judgment remedies. Bob is also experienced in general real estate matters, including, drafting and review of commercial leases, contracts for the purchase and sale of real estate, drafting and review of residential mortgage loan documents, review of lending procedures to verify compliance with RESPA, Truth-In-Lending, ECOA federal and state regulations, and drafting of loan servicing service contracts. Bob received a B.S. in Economics from Louisiana State University-Baton Rouge in 1972 and his law degree from South Texas College of Law in 1980.